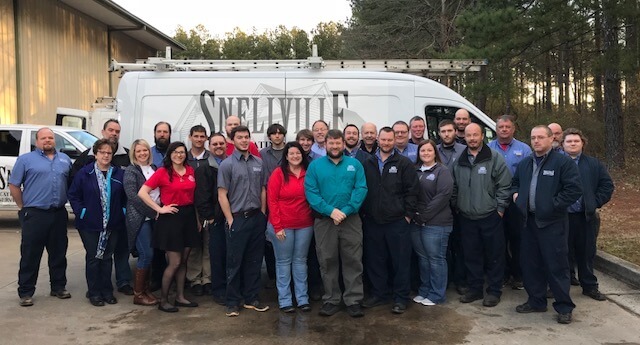 The Snellville Heating, Air and Plumbing story is a story about family: literally! The company was started back in 1988 by Don Vansant and his partner at the time. The focus back then was on new home construction and some light commercial work. After 8 years in business, Don’s vision for the business changed and he bought out his partner’s interest in the company. Don moved the business to Walton County and brought in a new partner: his son, David, who now serves as President of the company. As new residential construction really started to boom, the company continued to grow—until new construction and business in general slowed down in a big way. When the recession hit in 2008, the company scaled back drastically, and a new vision for the company took shape. Ever since, focus has been 100% on residential service and replacement work for homeowners. You don’t stay in business for 3 decades under the best of circumstances, let alone when you’re navigating your way through one of the most serious economic downturns that the country has ever seen. Simply put, you want to work with us because we’ll take care of you. We are 100% dedicated to our clients and their satisfaction with the customer and technical services that we offer. We are a licensed and insured residential and commercial HVAC and plumbing contractor. Our team comprises a highly skilled staff of NATE–certified technicians, licensed plumbers, and top–tier customer service professionals. We believe that a company is defined as much by its culture and vision as it is by the quality of the services that it offers. That is why our team adheres to a set of core values developed over the many years that we’ve been honing our service offerings. These core values include the following. Our list of certifications, licenses, and awards is also quite impressive. It really speaks to the consistent quality that we exhibit it eh work that we do. TrustDale Certified. We have passed Consumer Investigator Dale Cardwell’s unique, 7–Point Investigative Process, to be qualified as TrustDale Certified.